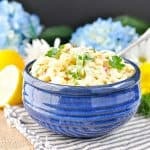 Home » What We're Eating » Classic Southern Macaroni Salad + a Video! 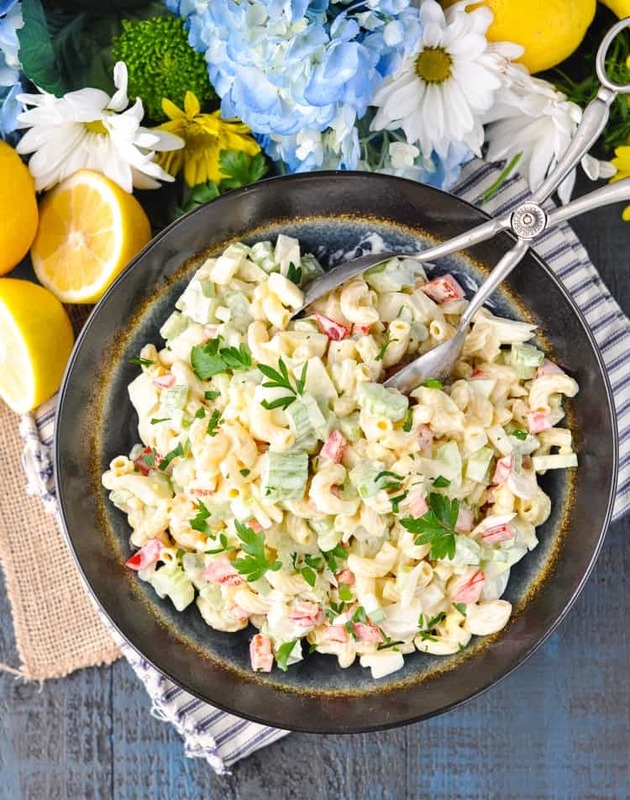 Nothing tastes better with a grilled hamburger or a barbecue chicken sandwich than a cool and creamy Classic Southern Macaroni Salad! 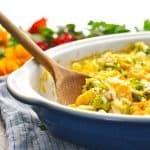 File this perfect side dish recipe away for your next cookout or potluck -- it always wins rave reviews! 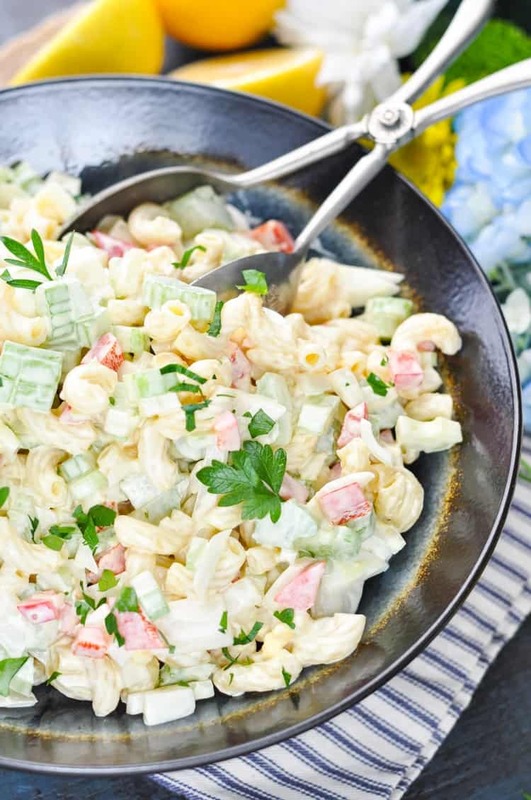 Nothing tastes better with a grilled hamburger or a barbecue chicken sandwich than a cool and creamy Classic Southern Macaroni Salad! File this perfect side dish recipe away for your next cookout or potluck — it always wins rave reviews! Well, we’re halfway through June and we’ve already hosted and attended quite a few cookouts with friends this season. When everyone has kids under the age of 10, it’s just the easiest thing to do! No restaurants, no sit-down dinners, and no agenda. 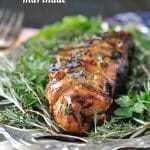 Just let the kids run around outside, throw some food on the grill, and open a beer! 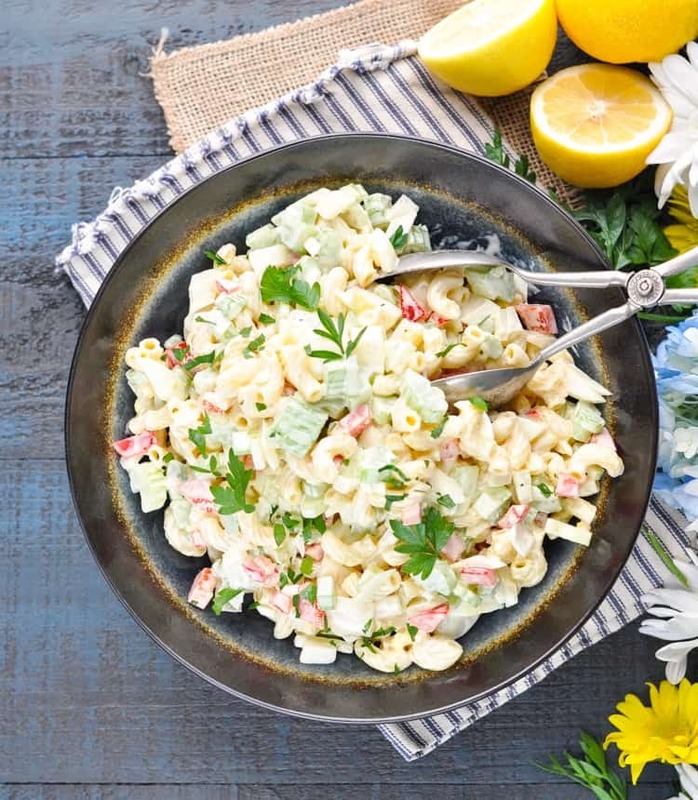 If there’s one common theme to any Southern picnic, I can assure you that it’s a creamy pasta salad. Specifically, a Macaroni Salad! No cookout would be complete without at least one of these classic side dishes. I’ve perfected my macaroni salad recipe over the years, and I’m finally confident in the version that I’m sharing with you today. The dressing-to-pasta ratio is ideal. The sauce has a slightly sweet taste in the background (without being overpowering), and there’s just a hint of yellow mustard in the mayonnaise-based dish. A garnish of fresh parsley is the final Southern touch that my mom and my grandmother would never omit! I hope that you enjoy this Classic Southern Macaroni Salad as much as my family does. It’s the one cold pasta salad that all 4 of my boys give two thumbs up! Cook macaroni according to package instructions. Drain and rinse with cold water.While the pasta cooks, chop the onions, celery, bell pepper, eggs, and parsley. 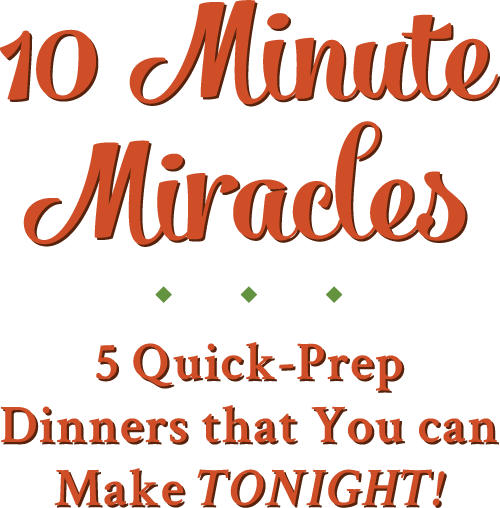 In a small bowl, whisk together mayonnaise, vinegar, sugar, mustard, and garlic until smooth. In a large bowl, combine cool pasta, onion, celery, bell pepper, eggs, and parsley. Toss with dressing and refrigerate until ready to serve. 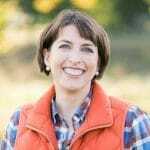 Previous Post: « Healthy Blueberry Peach Cobbler + Our Week in Meals #32! Aren’t cookouts the best?! It just screams summer, and you can’t beat the food. 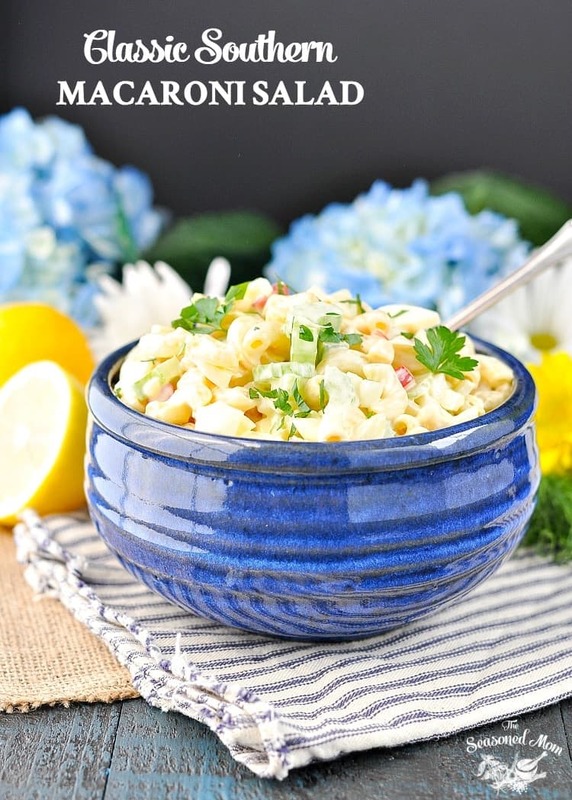 This macaroni salad looks amazing, Blair! I love the flavors and pretty color. Definitely a summer staple in my book! Where is the ingredients list? I got everything but that, instructions, etc., but no ingredients. Okay!!! Where is the list of ingredients with their amounts??? Am I overlooking something here or do I have to watch the video to get the amounts??? Thank you so much!!! Love your site!!! Okay!!! After posting my former comment the ingredients came up!!! Thanks!!! 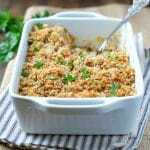 I make my version of this from spring to fall using different pasta shapes and with various meats from tunafish to shrimp but i use only fine chopped celery and red onion sauteed to soften before adding to the rest of ingredients sometimes adding dry ranch dressing mix to the mayo. Where is the actual recipe? I see instructions to put it together but no list of ingredients and the amount. I’m sorry but I didn’t care for this. The garlic just ringed it for me and my family, and we are Italian, put extra garlic on everything, but it just didn’t work in this salad. All your recipes I’ve made have always been on point, I’m sure it’s just a personal preference. Hi making your salad for about 25 guest. 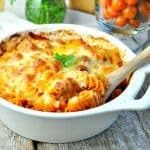 Can’t figure how to adjust amount of pasts and ingredient. HELP.. THANK YOU FOT IMMEDIATE RESPONSE. Hi, Angie! You can totally just dice the eggs if you prefer! I said “slice” because I use one of those hardboiled egg slicers because it’s quick. 🙂 They break up in the salad, so any way that you cut them will be fine!